The Mighty Mocambos have surely now exceeded the simple and restricted tag of being ‘Germany’s finest funk outfit’ and have now expertly evolved into one of the absolute best names in funk music. Well, if there was still any doubt about that as a fact then the imminent release of their brand new album, ‘Showdown’, will dispel all further arguments on the topic. As described by the Macombos themselves, their brand of unique funk features “blazing horns, soulful guitars, driving drums and basslines combined with an extra bit of quirkiness”. The aforementioned combination has seen them cultivate a feverish global fan base through a discography consisting of their own albums, including releases under Légère Recordings and Kay Dee; a joint album with UK funkstress, Gizelle Smith (‘This is Gizelle Smith & The Mighty Mocambos’); production and performances throughout Caroline Lacaze’s 2013 album, ‘En Route’; the development of their own label imprint (Mocambo Records), and a further evolution of their sound from the traditional deep funk nature of ‘The Mighty Mocambos’ to the Caribbean steely drum sounds of their alter-ego, ‘Bacao Rhythm & Steel Band’, who are now signed to Truth & Soul Records. In anyone’s eyes, that’s an incredible résumé. Which brings us to now and the brand new album, ‘Showdown’. The album’s concept is described in its title and its one that’s impressive in its execution throughout and ingeniously brought to life through the album’s guests with each tackling their own showdown under its many guises: social, political, romantic, etc. Afrika Bambaataa rekindles the now long-running chemistry with the Mocambos by appearing on three of the album’s songs including the break-y vinyl single, ‘It’s The Music’, with Charlie Funk and Hektek; soul singers Nichola Richards and DeRobert put in strong performances for their respective contributions, as does musician and producer Shawn Lee, who appears on the track ‘Catfight’. An inspired collaborator for ‘Showdown’ is German film composer Peter Thomas whose extensive film scoring and work on 60s sci-fi series ‘Space Patrol’ sets the album off perfectly in its attempt at capturing new sounds and directions and it’s only a shame that he hadn’t contributed to more of the album’s tracks. Well, it’s now time for The Mighty Mocambos to engage in one further showdown… and that’s with The Blue-in-Green Blog as we meet Bjorn Wagner for an exclusive feature to discuss the new album and all things Mocambo! IMRAN MIRZA: 'The Mighty Mocambos' are amassing such a body of work now - do you still feel the pressure of releasing new material? BW: Yes, absolutely. I would not call it 'pressure' though. It just comes naturally. We have so many ideas in our heads and hearts, so it's more a question of limiting yourself to the best bits. We have somehow set a high quality control for ourselves, and don't want to release dispensable music. Especially in a genre where the great classics most often date back to the early 1970s. Our motto is that we'd only record stuff that we'd spin ourselves alongside the best. That being said, we are still hungry and full of inspiration to bring a fresh look on funk for the people. Can you talk about the concept of the 'Showdown' for this album? The whole 'showdown' idea grew out of the international breakdance festival 'Plattenspieler' in Potsdam near Berlin, where we'd play live to the finals. The idea of two dueling b-boy crews inspired me to write a theme song for the grand finale, "The Showdown". We incorporated some western movie elements into percussion-heavy breakbeat funk to give it a cinematic, dramatic edge. When we started recording the album, we had no clue for the title of it, let alone an integral concept. I was generally looking for a more frantic, dark and epic sound to contrast the more joyful mid-tempo vibe of the last album, 'The Future Is Here'. When the first couple of songs were in the bag and first vocal takes done, I realized that everyone had gone with the dramatic aspect. Every story, every song is literally portraying a kind of 'showdown'. Be it political, love-related, a crime story, or through the sheer power of the music – most of the songs deal with confrontations. So I came back to the idea of a 'showdown', but in a hip-hop-battle kind of sense, peaceful and sportive. Given the number of guests we have on the album, the 'showdown' motto also works in the sense of a friendly musical duel featuring the best shooters in the game. How was the process of putting this project together? We started this album as we always do: gathering some ideas while touring, trying them live and then banging them out to tape in the studio. What was different was that we deliberately took a break from touring to finish it. That gave us more focus on the project. The creative process starts with having an idea for a tune while walking down the street, or riding your bike, or on the tour bus. We always try new songs at sound checks or even in concerts. Then, at one point, you actually think of making a record. I need this kind of vision to nail down all the crazy ideas and make them come alive in an appropriate context, otherwise they remain daydreams. Once we have decided to realize a production, the rest is really simple: we record the rhythm section and horns onto tape, add bits and pieces. Sebastian Nagel and I arrange the songs with the band, and then I usually give the multi-tracks to my brother, Steffen, in London, who does mixing and mastering, or better, the post production. It's great: the songs are really made during the recordings, there's not much need to rearrange or more general decisions to make. Most is done on the spot, and afterwards, Steffen and I can look at it from another perspective and concentrate on getting the sound right, laying down the finishing production touches and finalize the album master. The good thing about that is that the musicians have the freedom to play intuitively without bothering about the finished product, and the post production does not have to deal with straining live recording and songwriting sessions, so everyone has a fresh approach on what they’re doing. How did you go about picking the collaborators for this album? They basically picked themselves. We did not have to look long and far. We asked all our favorite and like-minded people if they'd like to contribute to the ‘Showdown’ – or they had asked us to think of them next time we'd record a track. There is no anonymous file exchange... we met Afrika Bambaataa and crew several times in Hamburg and France, and kept talking about songs that we could do together. Ben, our trombonist, did a road trip through the US and went down to Nashville, where he hung out with Nic and Dee (Nick DeVan and DeRobert) from GED Soul. He also had worked repeatedly with Shawn Lee in the past, for instance, on the Brothers Nylon single that we released on Mocambo Records, so it was clear that Shawn would be on the album. We have been in touch with all the features for a while, and then went from song by song to give each one the best possible platform to shine. How would you describe the relationship between the Mocambos and Afrika Bambaataa seeing the amount of times you have collaborated together? Bam is a bit like a musical godfather for us, the door to real funk, as he has the first hand experience, which he gladly shares. He was right there when the first block parties happened, which gave birth to hip-hop as we know it today, or the days of the Roxy in NY. He was the first hip-hop artist to sing with James Brown. Apart from his musical knowledge and status as one of the founding fathers of hip-hop culture, he is a very wise man and a genuine human being. Charlie and some of the others of his crew respectfully call him “pops” – which pretty much sums it up. In turn, he appreciates our music very much and I think it has to do with the way we play funk as a live band, which might be reminiscent of the days before hip-hop became beat- and sample-based. It's maybe something they have not heard in a while, and when we play him a track or rough idea, there is always that certain kind of sparkle in his eyes. Like a father with a bunch of crazy kids. You've developed such a strong and loyal fanbase through your music – how would you describe your connection to the fans? It's a blessing. We are in touch with our followers and, honestly, if there weren't people out there digging what we do, we probably would not be doing it on this scale. It's very important for us to hear what they think, and we take their feedback very seriously. A lot of the loyalty certainly comes from our vinyl focus, which is something that our fans love and which we take great care of. A real record gives value to the music and user more than a stream ever could. We are very grateful for the ongoing support and are in touch with many people directly, from sending out records to conversations after a show. 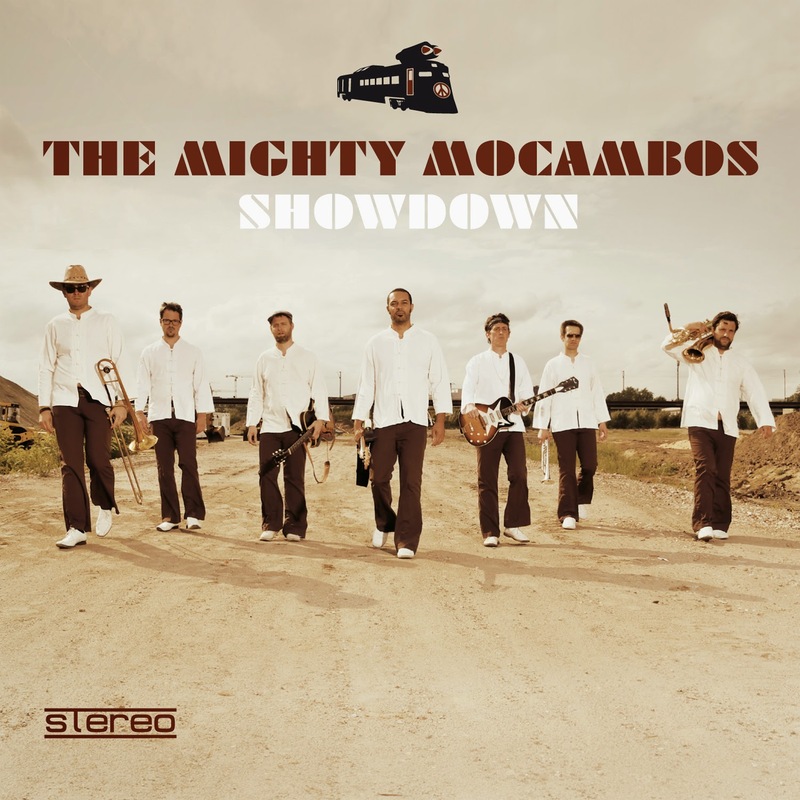 'Showdown' by The Mighty Mocambos is available to purchase from 27th March 2015. Hey, thanks for promoting our new album and supporting us! "Got to Give It Up": Music sampling and the Law!